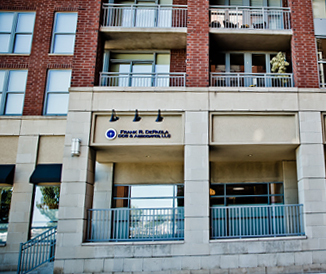 At The Practice at Maxwell Place, our Hoboken dentists understand the importance of a beautiful smile. Your smile can boost your confidence, make you appear younger and more attractive, and help others find you more approachable. As a result, our Hoboken cosmetic dentists are committed to helping you achieve the beautiful, radiant smile you deserve. We offer a wide range of cosmetic dentistry procedures to address all of your aesthetic goals. You won’t have to hide your smile out of self-consciousness any longer. Our cosmetic dentists can help you flash your smile with pride anytime you’d like. With extensive training in the most advanced cosmetic dentistry techniques, Dr. Frank can recommend a customized treatment plan that will help transform your smile into one of your greatest assets. Dr. Frank and our team of talented Hoboken cosmetic dentists approach your procedure from the perspective of an artist. They understand that no two smiles are exactly alike, and they will tailor your procedure to address your unique oral health needs and aesthetic goals. The best way to learn about your cosmetic dentistry options is to speak with Dr. Frank in person. Please call 201-792-9400 today to schedule your consultation. While general dentistry places a greater emphasis on the functional aspects of your dental restoration, cosmetic dentistry pays equal attention to the function and aesthetics. As a result, your restoration looks beautiful and natural, blending in seamlessly with your neighboring teeth. We only work with the finest dental labs in creating your restorations to ensure an exceptional quality result. At your initial cosmetic dentistry consultation, Dr. Frank will listen carefully to your concerns to find out exactly what you would like to change about your smile. He will then recommend the ideal treatment plan to help you achieve a beautiful smile that enhances your other facial features. Dr. Frank will answer any questions you may have at this time to ensure you are completely comfortable with the recommended treatment plan before moving forward with your cosmetic dentistry procedure. Dr. Frank devotes a significant amount of time every year to continuing education training in the field of cosmetic dentistry. He has taken many courses at the Las Vegas Institute for Advanced Dental Studies (LVI), the premier cosmetic dentistry teaching institution in the nation. At LVI, Dr. Frank has the opportunity to study under the finest cosmetic dentists in the country in order to master the most advanced techniques available. 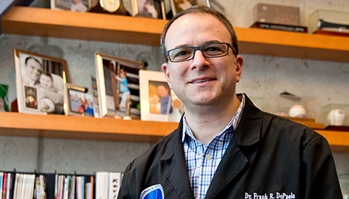 In the fall of 2015, Dr. Frank will complete his LVI fellowship. This accomplishment places him in an elite class of dentists. There are fewer than 500 LVI Fellows around the world.